Keeping swimmers safe is the most crucial task for aquatic facility managers. Luckily, there are plenty of tools at your disposal, from water safety training for patrons to lifeguard certification and training for a variety of types of aquatic facilities and more. While many facilities are transitioning their sports fields to synthetic turf, natural grass turf can provide many useful benefits. Tensioned membrane structures can be a great, quick solution when you want your facility up and running fast. And with new color options, your ability to customize a unique design has vastly expanded. With every line item in the budget under scrutiny, aquatic facility managers are looking for ways to reduce operating expenses, while still providing the cleanest, safest and most efficient swimming environment possible. There's more than one thing designers and architects can agree on when discussing natatoriums, but the bottom line on all their common ground is this: It's a building and environment unlike any other. From natural playgrounds to community gardens and expanding nature trails, getting back to nature is a powerful recreation trend leaving its mark on just about everything in the industry-including aquatic programming, attractions and facility design. Sports fields often must cater to a diverse range of sports and users—especially those serving park districts and local schools. Here, we talk to the experts about how to set your goals and design effective fields. Fitness is an ever-changing landscape, with new trends continually emerging, and old ones fading out. Running a successful fitness facility means remaining flexible and adjusting as each new trend comes and goes. From tensioned fabric structures to air-supported and beyond, there are plenty of options when you want to enclose your recreation, sports and fitness activities without getting involved in a lengthy and complex design-and-construction process. Programming your aquatic facility wisely can lead to a big boost in attendance—and revenue. Here are some clever ways to attract new users to your pool while keeping existing swimmers satisfied. Designing recreation facilities requires a flexible mindset, and an awareness that what students want now might not be the same as what they want next year. 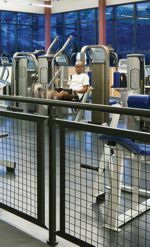 For fitness facilities, small group training can be a huge boon. Learn more about how this type of training can benefit your facility and members alike. There is a tremendous variety of art and sculpture in the public realm, and for the most part, kids love to play on anything they can climb. Here's how to make public art and play meet halfway. For those who dwell in urban and even some suburban areas, access to nature can be difficult, or even nonexistent. Here's how park designers help address the shortage—by creating parks that provide a respite from the daily urban grind. These days, many of us are living longer. And longer lives means more seniors to serve in our communities, and a broader range of active ages and interests and abilities to engage. While playgrounds will almost always be focused on children, more communities are finding ways to encourage play across all generations. 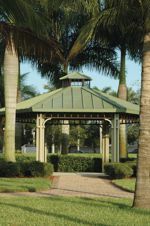 Site furnishings bring character and balance to a park's open space, with benches, water fountains and picnic tables being just a few of the common accessories you can find. 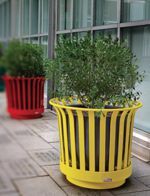 But furnishing your park site requires careful planning, too, with one of the best ways being to understand or determine the common or intended use for your specific areas. A natural connection is an important part of the park setting. In this feature, we'll look at how splash play areas are taking cues from nature to create inspiring settings, in addition to offering an understanding of water treatment options that help save water. Providing a range of recreational options can bring in revenue and boost excitement in the community. From riverfront parks to reclaimed lakes to manmade family aquatic centers, what are some ideas for transforming a source of water into a source of Wow! When this high school needed a new field for its football team and other programs, it looked to the experience of local experts. 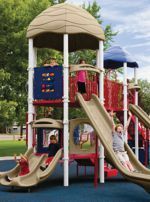 Your playground can stand out from the pack, but it's crucial that you work closely with an experienced and successful playground manufacturer to make it happen. The best sports, recreation and fitness facilities are designed by a team that works closely together, with an architect who acts as the conductor to orchestrate the beauty that is the end result. Giving Back The Boys & Girls Club of Monmouth County in Asbury Park, N.J.
At The Boys & Girls Club in Asbury Park, N.J., kids are exposed to aquatics who might not ever learn to swim otherwise. Here's what happened when the facility needed to improve its pool. Installing an UV system at a commercial aquatic facility will lower chemical usage in a pool by 30 to 50 percent and achieve safer water by eliminating pathogens, viruses and chloramines. Here's how to choose the best fit for your facility. Here we take a look at trends in facilities across the country, breaking down the information by region to understand how things differ depending on which part of the country they're located. Parks and recreation respondents make up the largest portion of the survey audience. Here, we examine some of the trends in these facilities, highlighting revenues and budgets, as well as construction plans and programming trends. Health, fitness and sports clubs represent a unique segment of the market, more often operating as for-profit facilities that must make ends meet. Here's a look at how things are shaping up for these facilities. Playgrounds have come a long way since their inception, with huge advances in safety, as well as increasingly creative solutions that get kids moving and having fun. Keeping aquatic facilities running smoothly requires close attention to daily, weekly and other regularly scheduled maintenance practices, as well as knowing when it's time to plan some renovations. To design and develop an effective trail or greenway, you need to start with a proper plan. Community involvement and funding partnerships will help get the project off the ground. At the glitzy Aria Resort & Casino, a new pool deck is turning heads. Splash play continues to be one of the most popular planned additions at parks across the country. But splashpads have come a long way since their initial introduction, as manufacturers have learned more about how people like to play in water. More and more schools and colleges are finding out that synthetic turf can be an effective solution for extending their season and programming on their baseball fields. Parks, sports, recreation and fitness facilities are finding innovative new ways to save money and make their budgets work. Whether through energy conservation, creative partnering or any of a number of other methods, these new strategies are delivering results. UV can be a useful tool for keeping your pool's water safe for swimmers, but there's more to this technology than meets the eye. There's a lot more than meets the eye to playground safety surfaces, and despite any claims about safety, the context of your site—including prevailing weather, use and much more—can have an impact. If you want to lower the operating costs of your aquatic facility, it can be helpful to begin with cost calculators, which can help determine areas of potential savings.